A letter revealed by the Orlando Sentinel shows the FBI requested law enforcement agencies who responded to and investigated the massacre at Orlando’s Pulse nightclub to withhold information from the public. A letter from the FBI dated June 20 attached to a lawsuit brought by the City of Orlando seeking the release of 911 calls in full, as well as other records pertaining to the shooting, had also been forwarded to the Seminole County Sheriff’s Office — but included instructions for law enforcement to deny all requests for information. Though the letter claims the 911 audio recordings and any other information pertaining to the mass shooting would have an exemption under the Freedom of Information Act’s Section 522(b)(7)(A) — “protecting records or information compiled for law enforcement purposes where disclosure would adversely affect a pending investigation” — the excuse seems flimsy and superficial. However, were the FBI truly looking out for the injured and families of victims, withholding information — which could reveal possible negligence or mishandling of an active shooter situation — wouldn’t be considered. In fact, refusing to release information that might help the families seek recourse or some semblance of justice stands contrary to that end. 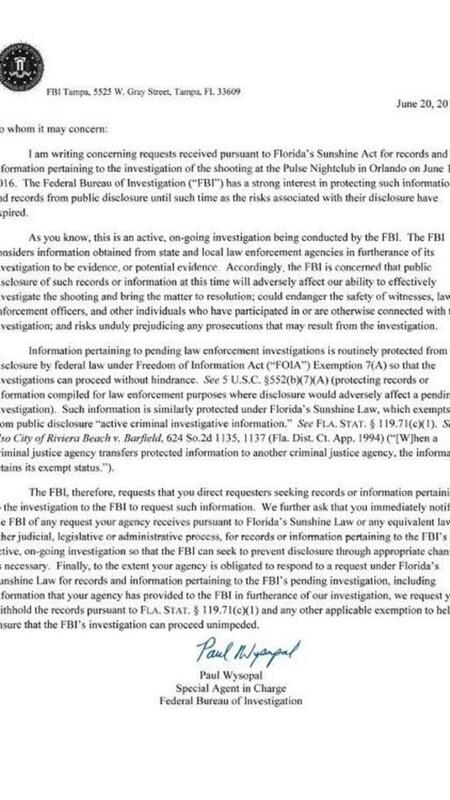 Despite the acknowledgement law enforcement would be “obligated to respond to a request under Florida’s Sunshine Law for records and information pertaining to the FBI’s pending investigation, including information that your agency has provided to the FBI in furtherance of our investigation, we request that you withhold the records,” under yet another exemption the agency invokes. As the Orlando shooting has come under intense scrutiny, and the response and handling of the subsequent investigation by local, state, and federal law enforcement agencies remains the subject of controversy, the release of information to the public is crucial. In the interim, suspicions about the incident’s apparent exception to rules concerning disclosure will remain a topic of debate.